Last year Microsoft revealed the plans to run and distribute desktop apps (basically all apps ever written for Windows) in the Universal-Windows-Platform “universe”. The project titel was “Project Centennial” and a year later the tooling seems to be ok-ish. So, let’s try something simple and convert a simple WPF app to UWP. 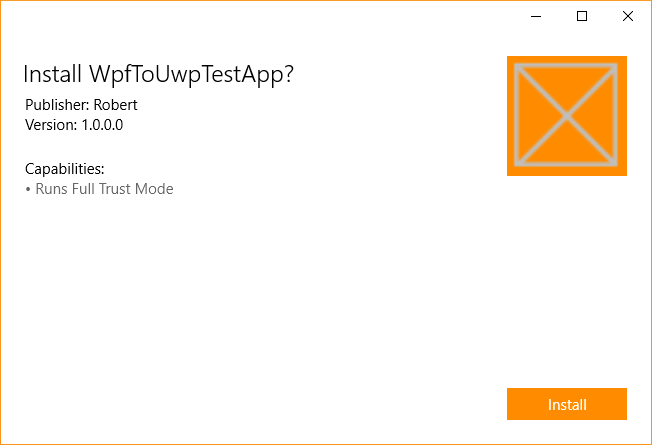 Be aware that even if you can “convert” your WPF app this way you will get a UWP-ish app. The executable will only run on a normal Windows Desktop System. The app will not work on a Windows Phone, Xbox or HoloLens - at least not now. Also keep in mind that certain operations might fail and that the outcome of some operations might suprise you. The app itself will run in a kind of sandbox. Calls to the file system or registry will be faked. Details can be found here. Some operation can leak out to the actual desktop, e.g. start another programm. If you have an existing installer or setup you might want to take a look at the [desktop app converter](https://msdn.microsoft.com/en-us/windows/uwp/porting/desktop-to-uwp-run-desktop-app-converter. This utility will convert the installer to a UWP package. A quick walk through can be found on Mike Taultys blog. 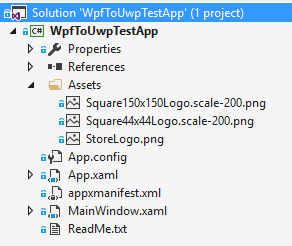 The important steps from the WPF app to a UWP app are also documented in the MSDN. Pretty simple, right? Those three operations came just to my mind. In general I wouldn’t use the Registry at all, but I had a use case in mind where I need to access the Registry. Now we are ready to create the appx package. 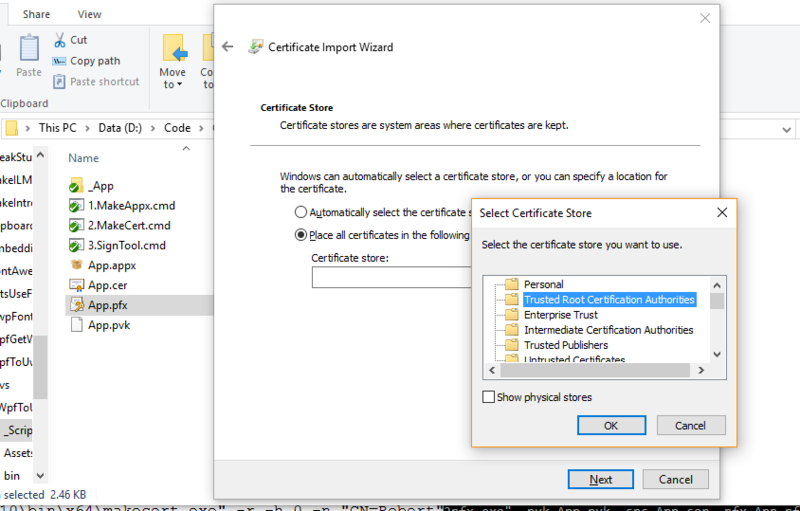 You need the Windows 10 SDK to do this. To simplify things, I copied the needed files from the build output to a folder called _App. "C:\Program Files (x86)\Windows Kits\10\bin\x64\makeappx.exe" pack -d "%~dp0_App" -p "%~dp0App.appx"
The result is a unsigned appx package called “App”. "C:\Program Files (x86)\Windows Kits\10\bin\x64\signtool.exe" sign /f "App.pfx" -fd SHA256 /p apptest "App.appx"
Open a browser: The default browser will be invoked for a HTTP url. It was my first try to convert a (simple) WPF app to UWP and the result is interesting. Hope my first steps in this world might help you! The code and a handy readme.txt is available on GitHub. James Hancock/John Galt discovered a nice registy trick. His goal was to “fake” a given registry key, so that the converted UWP app can see a “virtual” registry key. This can be done with a file named “registry.dat”. “The virtual registery is always the registry.dat. if you don’t provide a default version then one is created on first use for you. You can create such registry.dat files via RegEdit & export it as registry hive. Be aware, that my test run wasn’t successful, but I hope to get working sample. Until that I hope James comments will be helpful.